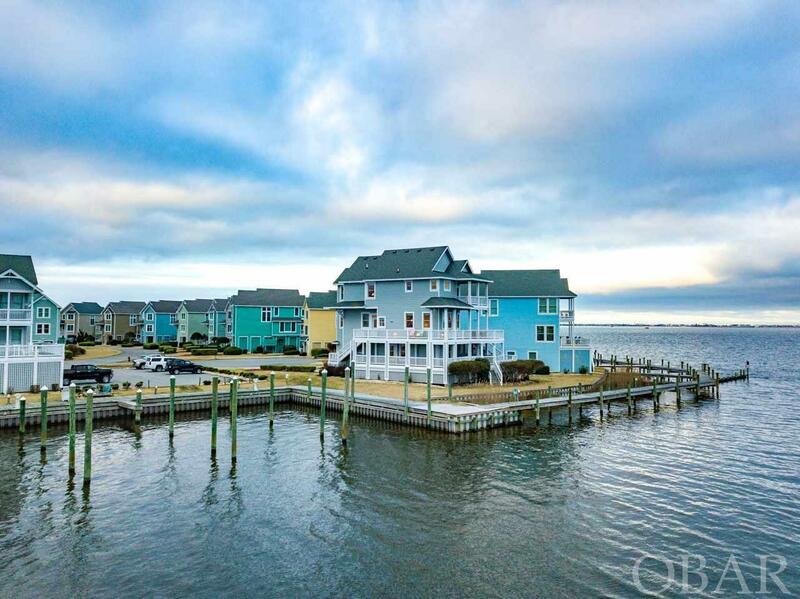 61 Sailfish Court, Manteo, NC.| MLS# 104118 | Outer Banks Homes For Sale, North Carolina Home Search Including Nags Head, Pirates Cove, Manteo, Kill Devil Hills Kitty Hawk, Southern Shores, Duck, and Corolla North Carolina, Oceanfront and Soundfront properties for sale and long term rentals. Lovely custom home on Sailfish Point. Fabulous views down the sound to Oregon Inlet. Watch the fleet coming home from your 2400 square feet of composite decking. This home has been extremely well cared for and has new exterior paint to include all trim and railings by Pamlico Painting. Owner has kept the rentals to a lower end with intent. Has held the price high - no discounts, even during winter months, no weekends, and no pets in order to keep it available for more owner use. 5 bedrooms, 5 and a half baths, with a hot tub on Sailfish Point, makes this home definitely one of a kind. Add all of Pirate's Coves amenities together with low maintenance and come on home. 30' of dockage is available on the canal.